The writer Pete Brook posed a question last year at Pickathon for a Wired.com story: What makes a good music photograph? 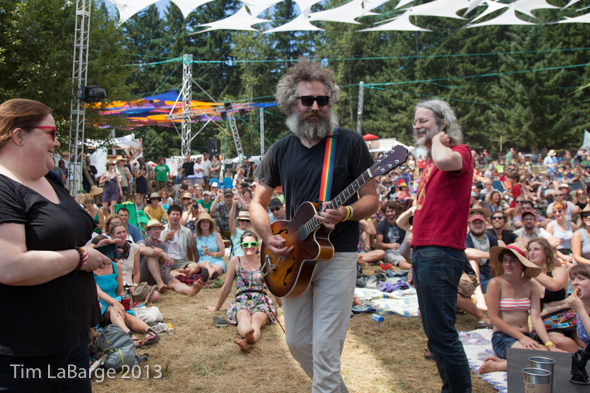 I’m quoted in the story, and yet, a year later and another Pickathon in the books, I still don’t know the answer. But last weekend, as I scurried around and split my time making pictures, managing the photo crew and enjoying myself with friends, I realized one thing: Something needs to happen for that picture to stand out for me…for that picture to be taken. It could be something the artist does or the circuitous route I took that led me to that performance. But I need something to happen to make it memorable for me. And so, here are a few images I made where something happened. They may not be the perfect music photographs. Something more interesting may have happened during the set or someone had a better angle when that one thing did happen. But from where I stood, at that moment, during a weekend where I happily got pulled in so many directions, there was a flicker of change and I made a picture. 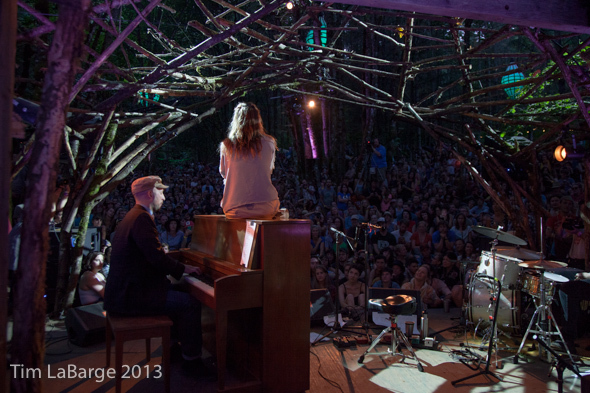 1.While playing an intimate set in at the Woods Stage, Feist was wedged between a piano and a drum kit, tiny and beautiful strumming her guitar. And then she suddenly decided to climb up on the piano and I looked out at the crowd and saw smiles. 2. James Felice, of the Felice Brothers, decided he needed a haircut after caressing beauty from his accordion in the Pumphouse. Here’s what it sounded like (the accordion, not the haircut): Live and Breathing. 3. Tift Merritt announced that she sure could use a beer and then she took a drink from her stainless steel cup. 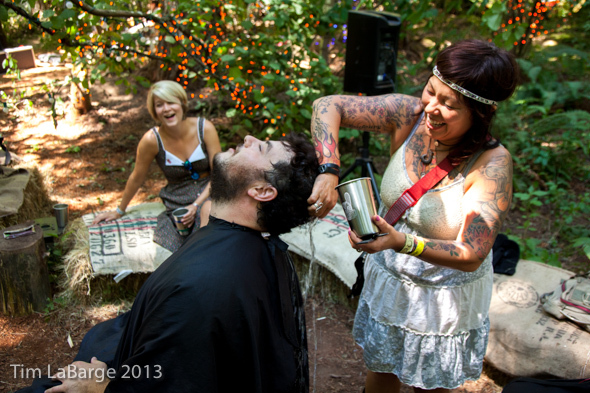 It must have been water, because when long-time Pickathon volunteer Dennis brought her a cold beer, he got a kiss. 4. Lights. 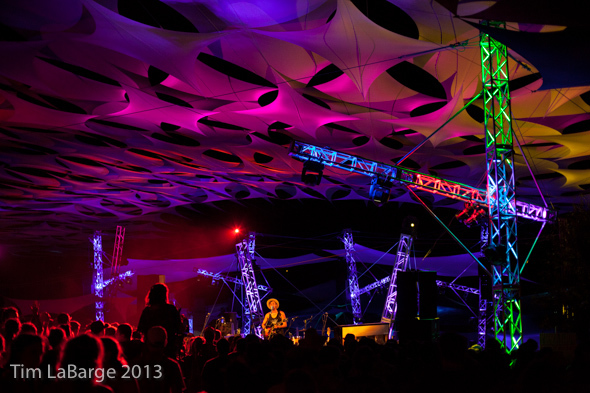 The night lights this year were amazing, like during Shakey Graves late night set on the Starlight Stage. Just wait a few seconds and the sails will change colors. 5. 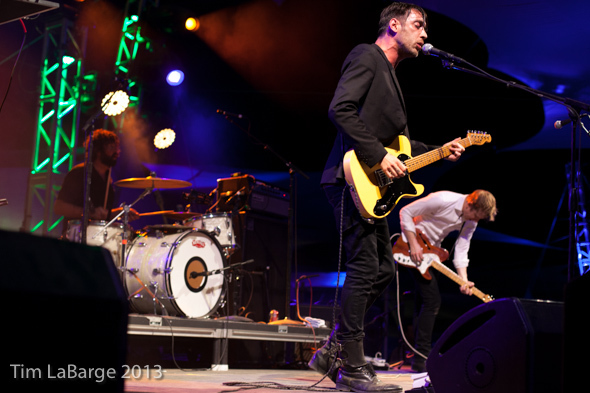 My kids love Divine Fits and so Sara and I let them stay up late to see them on the Mountain View Stage. 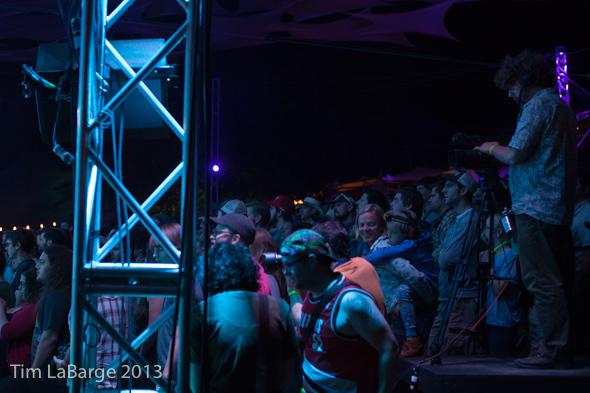 They hurried to get their jammies on and then there we were, each with an exhausted boy on our back watching what is probably the most unexpected, rocking set in Pickathon history. 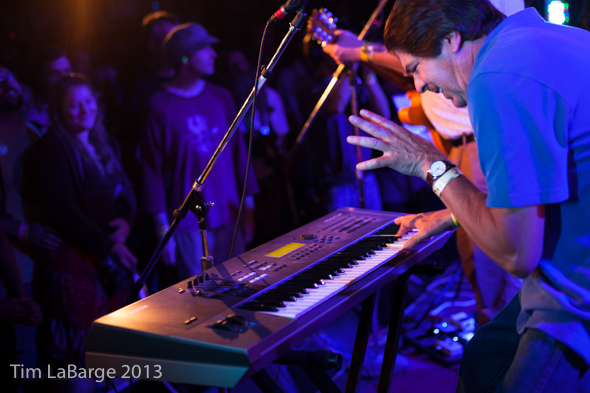 Jack fell asleep on my back dreaming of drumbeats and Leo is still talking about that keyboard player. 6. 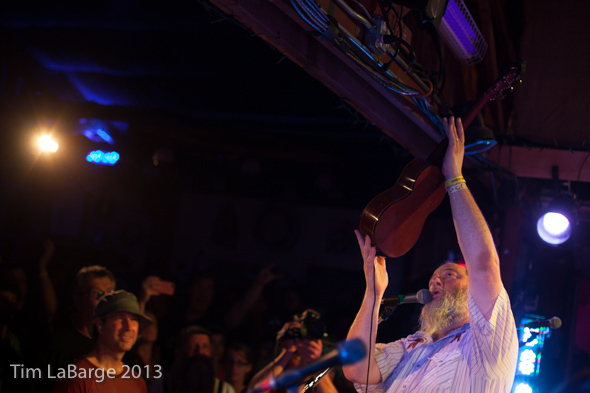 Shinyribs brought sweetness, joy and energy to the Galaxy Barn along with the entertaining keyboard player – Winfield Cheek – who turned to us several times before shredding his Yamaha to let us know we were going to love this one. Yes, we did. All of them. 7. 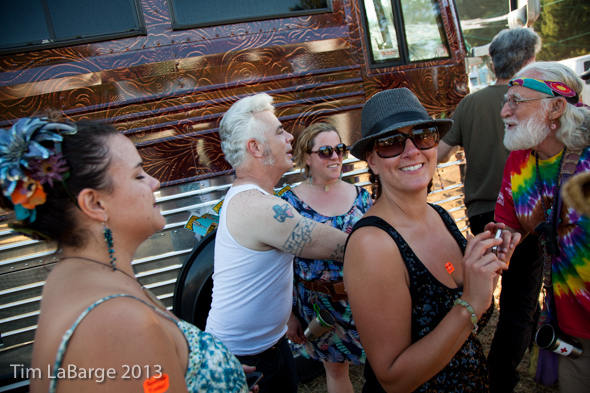 I happened by Dale Watson’s bus to find him entertaining the gals and the guys. Everyone was happy and I love that. 8. Andrew Bird whistled in the woods and I heard it from three feet away. 9. 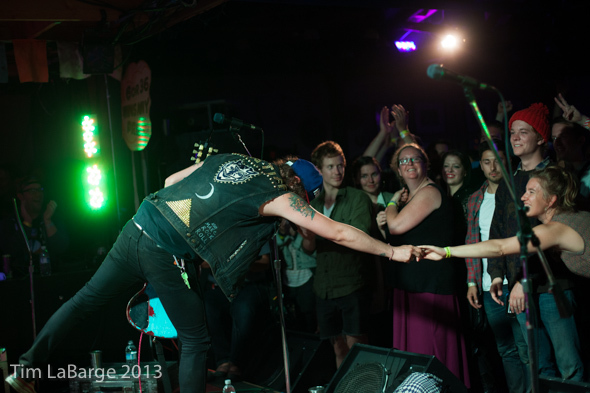 Old Light jumped off stage and tore it up in the crowd. 11. 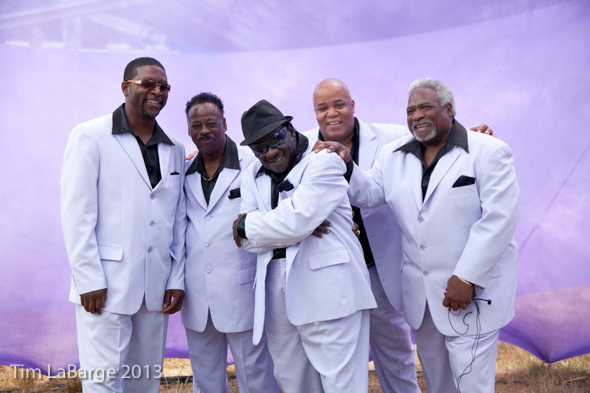 The incredible gentlemen from The Relatives talked to me. Gean West asked if I was going to use my pictures for advertising. I got concerned that they were worried about rights to my images and first three songs and other annoyances of the industry. I said they’d be used for promotion and he responded: Oh good, then someone out there might see my face in a picture. Indeed, Mr. West, you deserve to be seen. This entry was posted on Tuesday, August 13th, 2013 at 10:19 pm. 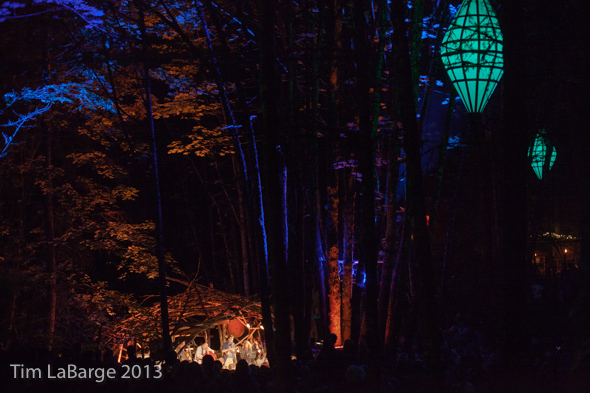 It is filed under music, pickathon and tagged with music, oregon, photography, pickathon, portland. You can follow any responses to this entry through the RSS 2.0 feed.